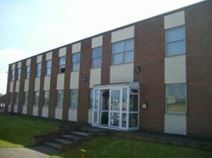 With flexible, all inclusive terms, this office building, about 40 years old, is half a mile from Wellingborough town centre. Agreements are for all utilities and rates and can be formed on a monthly rolling basis. The location is handy for all town centre amenities with a mainline railway link and the A45. Facilities include kitchen, vending machine and free use of broadband internet. Large office space with on-site parking in the town of Wellingborough. The location of this space is great for the railway station with mainline links and easy access to the M1. The site is handy for local bus routes and town centre amenities.